Looking for a slow cooker recipe for a hectic day? We’ve got you covered. This Hawaiian Pineapple Crockpot Chicken recipe is a sweet find. This recipe is part of our Down & Dirty Dinners Series. With each Down & Dirty Dinner recipe, you’ll find quick-unedited phone snapshots from everyday moms making dinner just like you. Today was one of those days where the girls’ after-school activity schedules conflicted. My older daughter and I needed to eat dinner at four o’clock, while my husband and younger daughter needed to eat at five o’clock. In the past, we’ve defaulted to grabbing something quick at Panera while on the run. However, we’ve been trying to be a bit more money conscious. The frugal (and simple) answer? Throw something in the slow cooker that would be hot for the full hour. This Hawaiian Pineapple Crockpot Chicken recipe was so colorful; I had to snap a couple of pics with my iPhone to share. A simple and sweet slow cooker recipe! Add the chopped pineapple and red onion to the bottom of your slow cooker. Using a skillet brown your chicken breasts. Carefully add the chicken into the slow cooker. Whisk the honey, soy sauce, brown sugar, ginger and garlic in a small bowl. Add the cornstarch with a tablespoon of water, mix, and add to the slow cooker with the chopped bell peppers. Let it cook an additional 30 minutes while you make some rice to eat with your meal. The sauce seems thick, but with the juices from the pineapple and chicken it thins out. You could easily substitute canned pineapple for this recipe. I bought a three pack of peppers–so I just used them all. I cheat and use the Spice World squeeze garlic and ginger. When my daughter and I got home, we simply popped on the rice cooker, got her gear for softball ready, and then ate. Easy peasy. Can I tell you how much I love our rice cooker? It is not that rice is hard to make, per say. It is just that with a rice cooker, you can throw it all in and WALK AWAY. When the rice is cooked perfectly, and the machine simply pops into a “warming” setting when it is done. When you’re trying to balance 101 things or keep food warm for an extended period of time, it is wonderful. The kids and my husband plowed right through this Hawaiian Pineapple Crockpot Chicken. I admit I prefer my pineapples and peppers roasted. I like the charing on edge. To each their own. 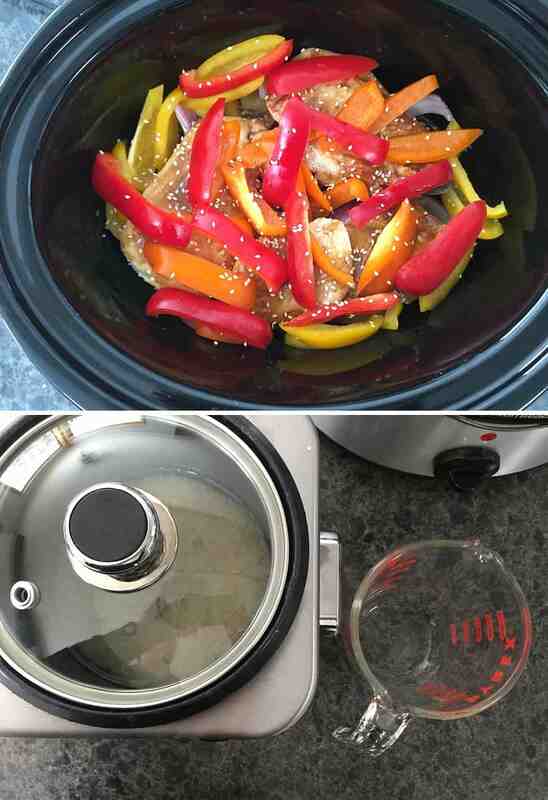 This slow cooker was the perfect solution for this hectic day! again to check out any new posts! And I can switch out Restrict Content for PMP? With the same functionality?